I built the Kits and Parts RF Amplifier. Unfortunately it didn't work. When power is applied the meter in my bench power supply reads 0.01A. As soon as the Propeller beacon starts the current draw increases to 0.03A (at 8V). But the needle on my QRP power meter, which shows more than 25mW from the barefoot Propeller, doesn't budge. I don't understand it. It's a simple enough circuit, there isn't anything to go wrong. Unfortunately I find these kit construction failures too demoralizing. I struggle with my vision and shaky hands just to build the board. Desoldering and faultfinding are beyond me at the moment. If I do discover the cause of the problem it's something really obvious that anyone with a normally functioning brain would spot. I think it is time for me to accept my limitations and stop attempting to do what I used to be able to do before my brain surgery. From now on if I can't buy what I want ready to go out of the box I'll just have to do without. Hey don't be discouraged, on the flip slide most everything I do I'm assured won't work, and so far (two projects, heh) have somehow worked. Perhaps you can email them, and then the whole testing thing ya know it is probably something really stupid, as it always is, and as soon as you find it you'll forget all about this. Best of luck to you, and thanks for a great blog. Don't get discouraged, keep plugging away. The manner in which you have responded to your life changing predicament has been inspirational. Some one of lesser character would likely have given up long ago. As to your amplifier. I have built quite a number of these both from Diz's kit and from scratch. They do work very well and are quite robust as is the 2n5109 transistor. There is nothing in the picture that appears out of sort. At this point I would guess that perhaps the toroid is wound or more likely installed incorrectly. The input and output impedance with the bipolar toroid transformer is 50 ohms. One of the options is to replace the bipolar transformer with a more simple RFC choke in which case the input and output impedance is 200 ohms. Given that the output impedance of the propellor generator is unknown I would suggest you opt for the simpler winding of the torroid and go with the 200 ohm impedance. There will be some mismatch between the 200 ohm amp and whatever antenna you are using but with such low power (etc) it shouldn't make much difference. The transistor is sufficiently robust that it should be OK.
25mw drive should be quite sufficient. In fact, a simple input attenuator might be in order. I use one of the amps as an antenna preamp with great success on LF and MF with about 20dB gain. Thanks, Graham. I'll probably try that once I feel like having another go at it. I was reluctant to pull the toroid out as I fought for an hour to get the four wires through the holes in the first place. But it does seem like the most likely suspect. 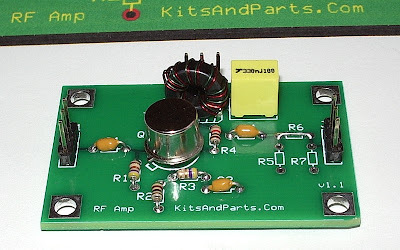 I've built some amps similar to your design and the wire on the torroid should be twisted. That's probably your issue. Also stated in another comment: check polarity (one start coil to the end of another and then to C4). Also don't expect to much power from it in the transmitting side but it's an excellent design for the receiving path! I don't see any syntax error. But I didn't write the code for this page. I expect Blogger has borked something.